In-stock and discounted wooden barns and garden sheds are now for sale from Sheds Unlimited at a cheaper price and 50 miles of free delivery. Discounted barns and sheds can be used as wooden tool sheds, wooden play sheds, farm storage sheds or a two story wooden shed for the ultimate storage solution. There are countless uses and almost as many options to make every wooden storage shed from Sheds Unlimited a truly personal building. Sheds Unlimited Inc of Lancaster, PA has announced a discount on all in-stock wooden barns and garden sheds through the end of September. All wooden storage sheds, wooden farm tool sheds, wooden bicycle sheds, vinyl storage sheds and two story wooden buildings are now available at discounted prices and include great deals on all wooden sheds and garages in-stock. Sheds Unlimited management personnel report that “all of our discounted wooden sheds and garages include the full Sheds Unlimited guarantee which comes with a made-to-order shed or garage.” The only difference in these wooden sheds and garages that are on the lot is that they are ready for quick delivery. 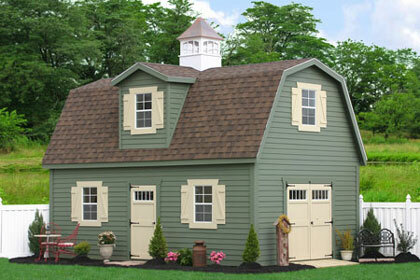 Discounted wooden sheds and garages are brand new buildings. Many of the buildings were built over the slow winter months or are a result of customers making changes to an order after the building was delivered. But the great part of buying one of Sheds Unlimited’s in-stock backyard wooden sheds is the deep discounts. 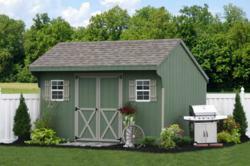 These wooden garden storage sheds carry a five to ten percent discount from the price of made-to-order prefab sheds and barns. In addition, Sheds Unlimited is now offering FREE SHED DELIVERY to any location within 50 miles of their Lancaster County manufacturing facility. Homeowners outside of this area can call 717-442-3281 to find out shipping rates to their location. Not only is Sheds Unlimited offering discounts on outdoor wooden bicycle barns, all of their in-stock buildings are now being offered as discount sheds and garages. Although there are few left, the discount vinyl sheds also come with the fifty miles of free delivery, the Classic Sheds offer the same and even the one car garages which are on display come with the same discounts. Two story wooden sheds in stock are both deeply discounted and also come with a 50 mile free delivery perk. If you are looking for a wooden farm tool shed for the backyard, a two story wooden shed or a beautiful prefab vinyl shed or garage, Sheds Unlimited has options available at discounted prices. Visit their website and take a look at the wooden two story shed and the beautiful wooden two story garage and you might soon be looking for a way to get one of those installed on your property. 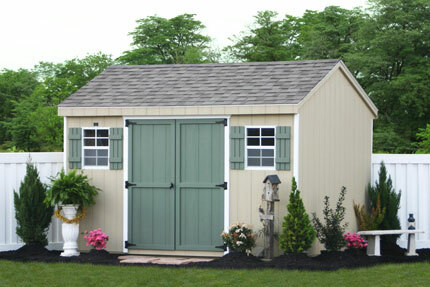 For nearly two and a half decades Sheds Unlimited has been producing wooden storage sheds, backyard vinyl sheds, classic storage sheds, premier wooden garden sheds and 2 story wooden sheds and garages for customers in Pennsylvania, New Jersey, New York, Connecticut, Delaware, Maryland, Virginia, West Virginia and beyond. Their goal is to provide a quality sheds, barns and garages direct to customers within their delivery area and to do so with superior customer service. Recent additions to the Sheds Unlimited line have been backyard chicken coops, Premier prefab one car garages, the two-story sheds and barns and many other options to make each building as unique as the need they are built to fulfill.